I am so lucky to have landed a position on Petaloo's Design Team. I mean really...just look at the beautiful, soft flowers that I get to work with...and the owners of the company are just a sweet and gracious as they come! 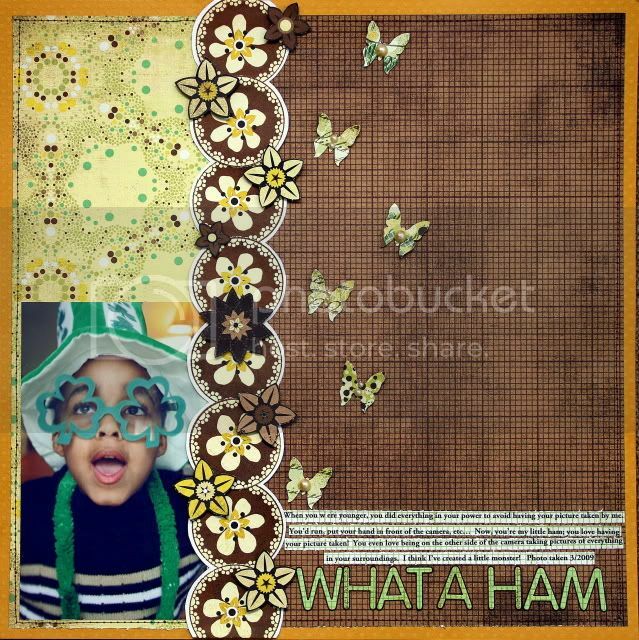 On this sweet layout of my boys, I used: Flora Doodles Black Box Collection- Bristol, Flora Doodle Black Box Collection- Delila, and Flora Doodles- Sweet peas. I spritzed one of the flowers with shimmerz to change the color from white to yellow. I captured this picture of my boys chilling by the Christmas tree. Donovan was playing opossum, but I like the photo still. I used Petaloo's jeweled florettes to here-- I think they look great with the new Kiki Art paper and chipboard hearts! I created the following layout...just because! I took a bunch of darling photos of Donovan and Xander last St. Patty's day and I think this is one of my faves of Donovan. He is such a ham! I remember when he used to hate having his picture taken...I used to have to sneak...now he loves to be in front of and behind the camera! A Blog Crawl Is Coming!!! Consider yourself formally invited....and please be sure to pass the invite on to all your friends too! On Friday, March 5th be sure to visit Bella Blvd, Jillibean Soup and Nikki Sivils Scrapbooker for all the information on where to go next and how to win! Mark your calenders!!!! It's a date!!! Can't wait!!!! I have lots of goodies to share with you today!!! First up is my first Petaloo project! I love how well the jewels in the Color Me Crazy Jeweled Florettes coordinated with this new line from Bella Blvd (All Inclusive). Although you can go crazy with coloring, stamping, inking these pretty petals, I chose to leave them plain. I like the touch of feminine class that the white flowers added to my layout. 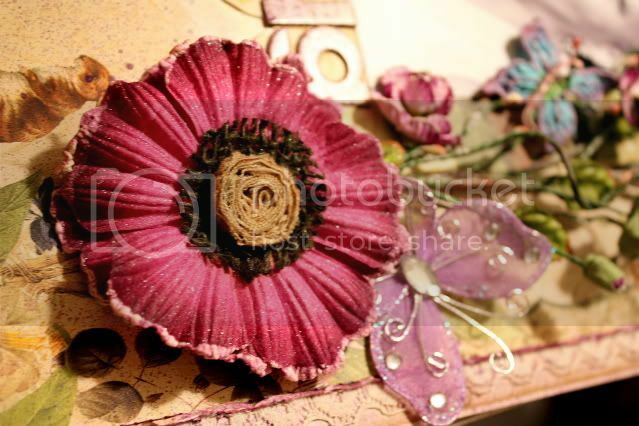 I am so thrilled to be a part of Petaloo's very talented team and look forward to a creative and exciting 2010! 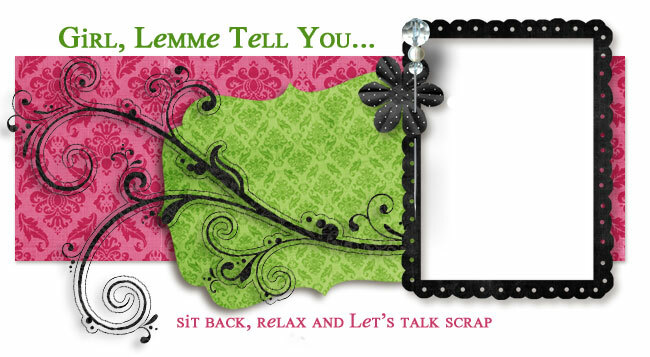 Here are a few more layouts that I created for the Sketch Class at scrapfreak.com. You can read more about it in this post. I completed all 10 sketches and cleared 33 pictures off of my scrap desk...I'm so happy about that!! Does Xander look like he's having a great time or what? I took these photos of him at the park this summer. This little boy mastered the slide!! He went up and down like an old pro....you'd swear he'd been on one before the way he's walking up the slide. He is my little dare devil! 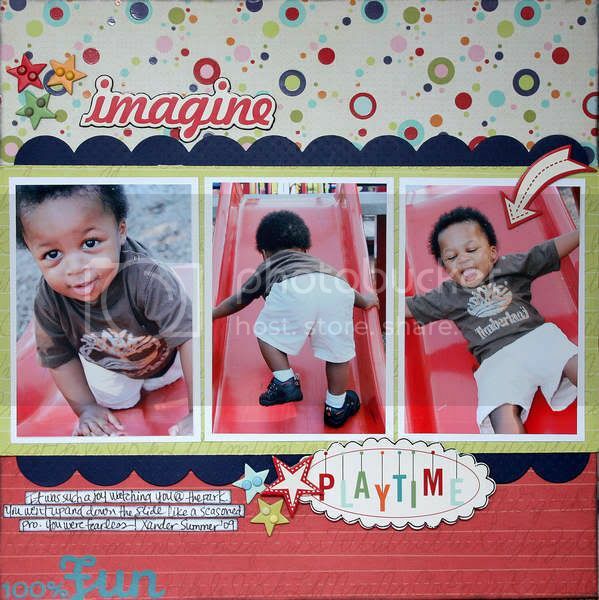 I remember taking Donovan to the playground when he was the same age and he was so apprehensive. I had to walk him through everything time and time again. 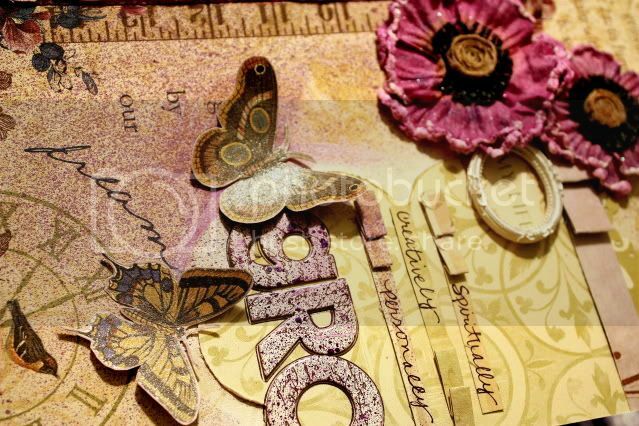 I used Cosmo Cricket's chipboard and rub-ons and Imaginisce Teacher's Pet papers here. 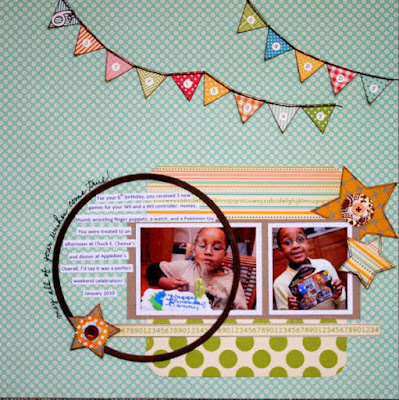 This next layout is a testament to how quickly time flies! I remember this day like it was yesterday, but it was 3 1/2 years ago!!! Donovan was about 2 1/2 and the 2 of us joined a few of my friends and their kids at Sesame Place. I remember him crying so hard when he saw the characters. As long as they weren't in his site, he was fine. He loved the water park, though and the fact that I let him roam around instead of riding in the stroller all day! It was HOT that day, too! 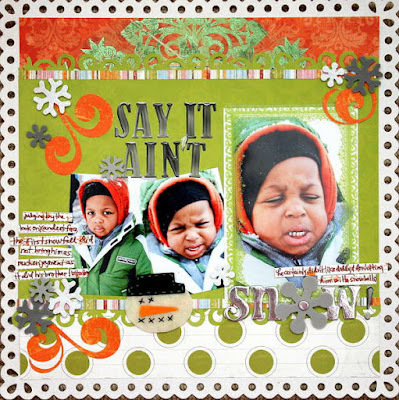 I used new Graphic 45 and October Afternoon papers and Bella Blvd's new coin alpha here. 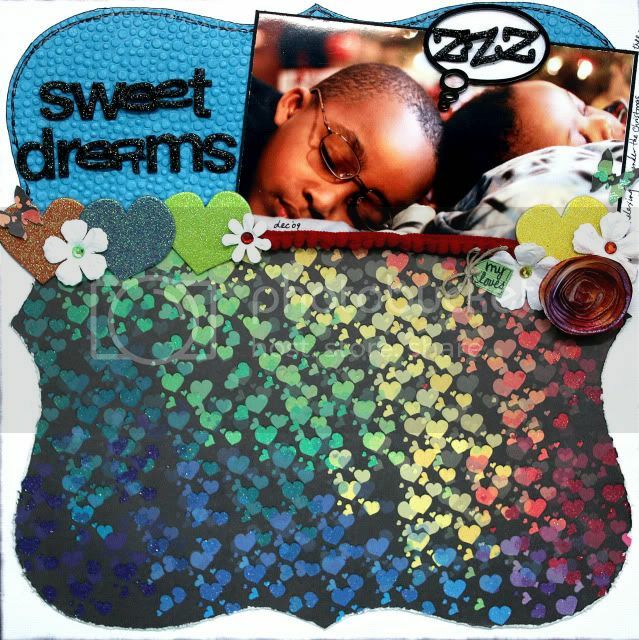 I had fun playing around with Basic Grey Sugar Rush and smooch spritz on this layout. I got a little creative with the title here. I searched and searched the internet to find out what a person who loves the snow is called. I came across the word "chionophobia"which means "fear of snow". I figured if I changed -phobia to -philia or -philic, it would change the meaning from fear of snow to love of snow. I have never known a child who loves snow more than Donovan! He could stay out in the snow forever if I let him. He's always loved it, too. I guess that has a lot to do with the fact that he was born in January and it snowed the day I bought him home from the hospital. How perfect are these papers from My Mind's Eye. Can you believe they're Christmas papers? Love when I can get more than one use from supplies! Thank you so much for your support and lovely comments!!! Hope you have a scrappy day! My day started out pretty early. 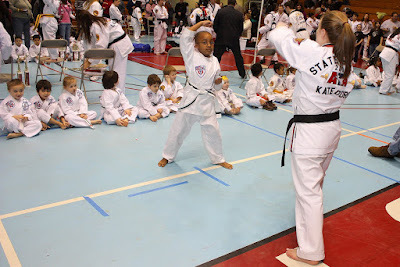 I had to get up at 7:00am to get Donovan and myself ready and out the door to his first karate tournament. 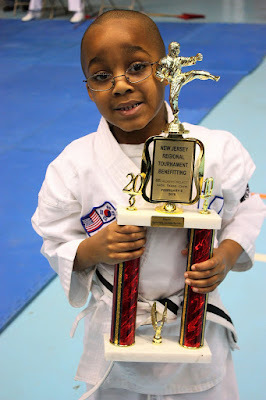 This past summer we decided to put him in karate to help with his coordination, keep him disciplined, and continue to develop his self-esteem. He liked it so much that we signed him up for the black belt club. So far...so good...he really enjoys karate! I was so proud of him today. He stood in front of all the other kids in his group and their parents and proudly demonstrated the moves he's learned up to this point. He usually gets really shy in front of unfamiliar groups, but not today...I think he's finally out growing that! He received a trophy for "Super Sportsmanship/Spirit". He was so excited as were the other children. Way to go Donovan!!! Keep up the great work!! My first post is up on Buzz and Bloom's blog. 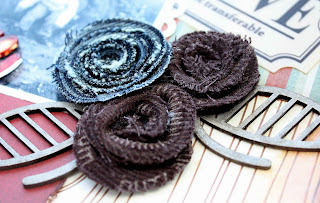 I posted directions for making these awesome denim and corduroy flowers. Pop by and check it out! Ahhhhhh...love is in the air! In celebration of this endearing holiday, I created this card using Imaginisce Spooky Town and Polar Expressions. 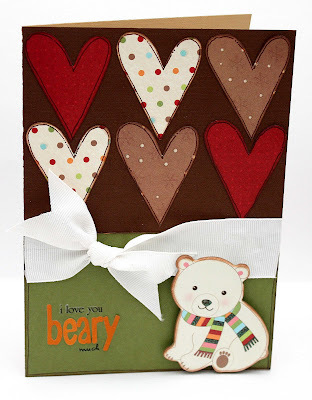 This card, along with a bunch of other Valentine ideas are up on Purple Cow's blog. 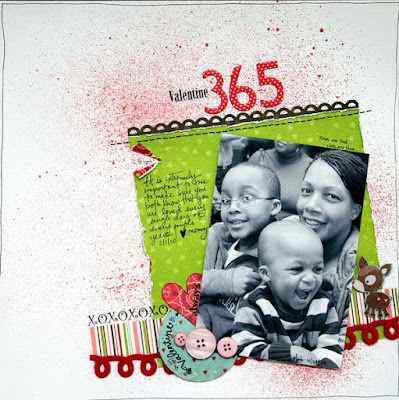 To recreate this card, you can find step-by-step directions here. Have a happy Valentine's Day!! I don't know about you, but I love it when I find a really good sketch! Sometimes I'm in the mood to scrap, but the mojo isn't flowing, so I turn to some of my "go to" sketch sites for inspiration. Other times I need a blue print to help spark my creativity. I love how versatile sketches are and that they can be used as a springboard. Sometimes my projects end up looking nothing like the sketch that I started with. There are 10 sketches in total, but 20 fun examples! I will post one sketch per day for the next 10 days so you will have all 10 by the 10th. To qualify for a fun RAK from me, you have until the 28th to finish at least 4 layouts. Every layout past the 4th gives you an extra chance to win. Do all 10 sketches by the 28th for a special something! Feel free to rotate sketches, add or subtract items, change the number of photos, etc. Make it work for you! We really focused on multi-photo sketches to help you catch up on all those photos! So get some stuff printed But you can always replace a photo with PP or a journaling spot if you want to do single photo layouts. I've already completed 5 sketches (1 posted previously) which equates to 15 photos that have been cleared off of my scrap table! YES!! "Yummy Cupcakes" is based on a sketch by Amy. 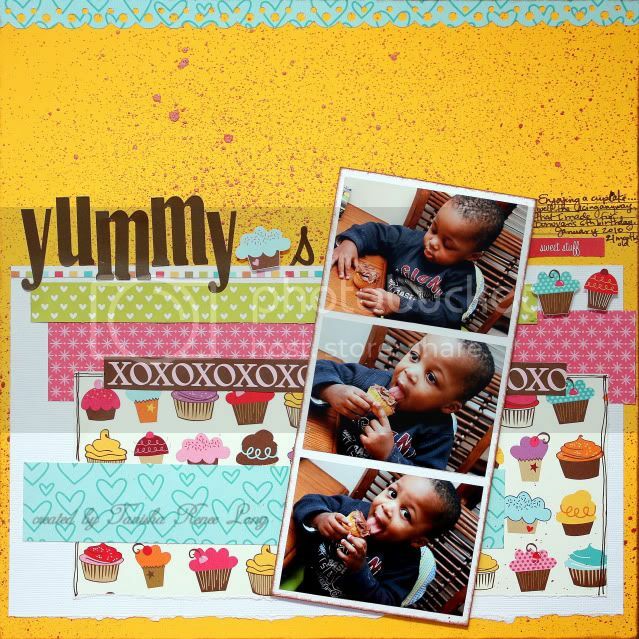 I used my fave smooch spritz and 3 different Bella Blvd lines (Flirty, Sweet Celebration, and Estate Sale) to create this layout of Xander enjoying a cupcake (well the icing anyway). (Trimmings) is based on a sketch by Bree; I flipped some of the elements and added different size photos. So happy that I was able to put those Making Memories Christmas papers to use. "Not So Scary" is also based on a sketch by Bree. 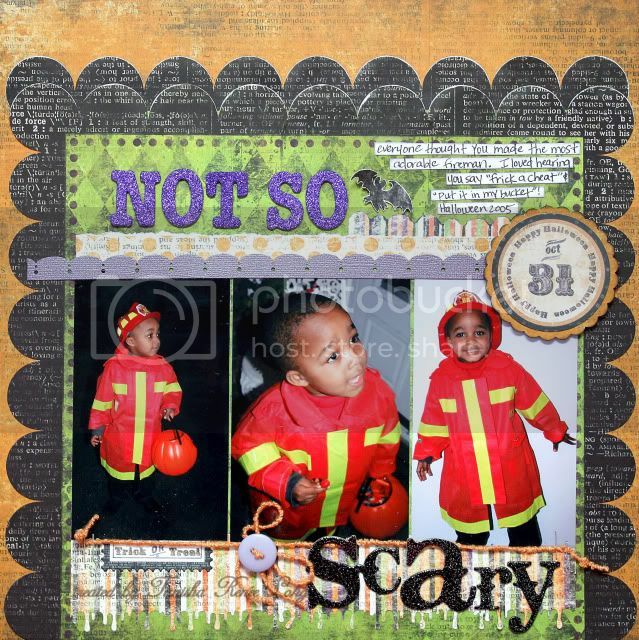 I used Pink Paislee's Twilight papers to highlight photos of Donovan on his second Halloween. He's the same age in these pictures as Xander now. I remember ringing the door bell so he could say "frick a cheat!" "Put it in my bucket"! "Eye Doc" is based on a sketch by Cherie. 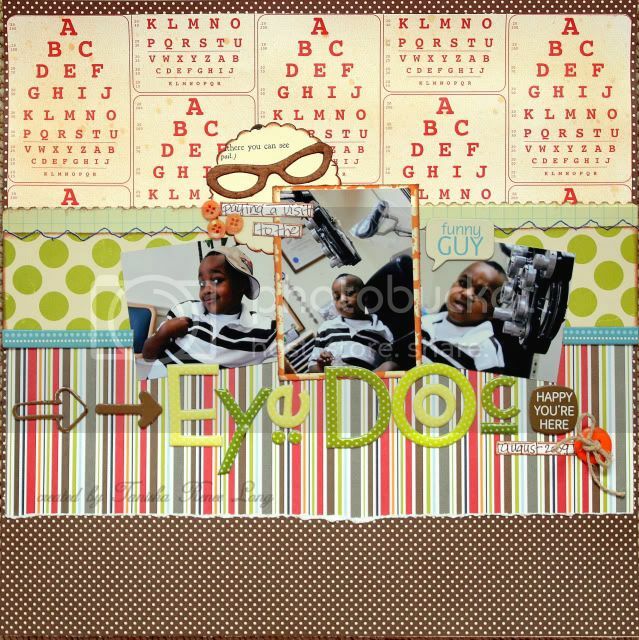 I mixed some new October Afternoon Papers with some existing Jillibean soup papers and new Bella Blvd chipboard to create this layout about Donovan's first trip to the eye doctor. He is such a silly boy! Instead of smiling for the camera, he opted to make faces! That's so Donovan! 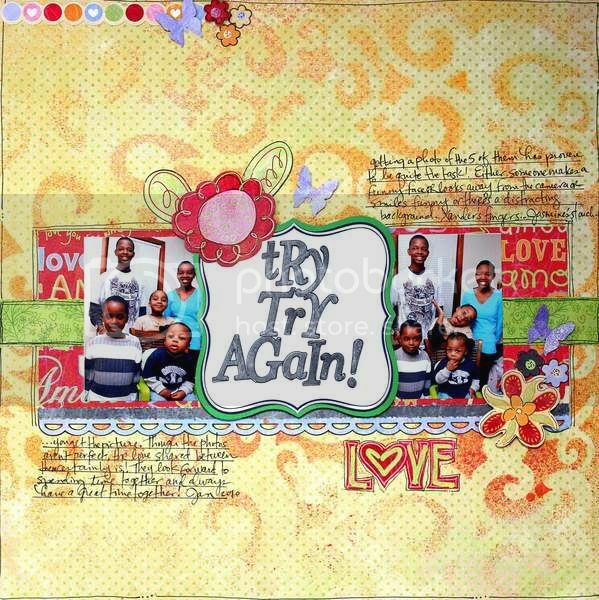 Lastly, is a layout created using Blue Media's February sketch. Bo Bunny's Love Bandit papers really offset the the photo of the boys and me nicely. Look how tiny Xander was!! I can't believe my baby will be 2 years old in 2 months! Thanks so much for popping in! I hope my projects have inspired you to get sketchy with it! LOL! Just remember to give credit. The newest sketch winner has been announced over at Creative Imaginations' blog...check it out! The winner will receive a prize package of CI products and join us as a guest designer for March. Here's my take on the sketch! I pulled the colors directly from the photos to highlight Xander's mood on this particular snow day. He was not happy with being pelted with snowballs at the hands of Daddy and big brother! February's sketch will be up soon, so stop by and join in the fun! I am so excited to announce that I am joining Petaloo's Design Team along with the following very creative ladies! Our team will be headed up by DT Coordinator, Cheryl Mezzetti. I am looking forward to a very fun and creative year!!! Ring the cowbells and round all of your friends up, because everyone is going to want to hear this udderly fantastic news!Purple Cows has partnered up with Joann’s to give you the best new tool at the best price EVER! Sometime in the next week to ten days, your local Joann’s Fabric and Craft Store will be THE exclusive location to purchase our brand new #3025 Hot/Kool Laminator –and it is only $59.95! So make sure you get into your local Joann and get your hands on the “hottest” crafting tool out there. 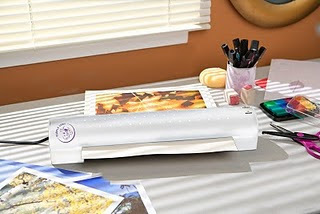 With this 13” wide format laminator you will be able to laminate items you never dreamed possible! 3 mil, 5 mil laminating pouches are available, and speaking of pouches, we have a huge 100 assorted size Hot Pocket pack for only $29.95, to go with this “Kool” new tool! Go to your local Joanns and get yours before they stampede off of the shelves! They will be in stock ANYTIME between now and the end of Febuary!Come back tomorrow, and see an example of the fantastic projects you will be capable of creating with the Purple Cows #3025 Hot/Kool Laminator, and to hear about MORE of the great features of this Moo-riffic new tool! This past weekend, we had a celebration for Donovan. On January 29th, he turned 6 years old and let me tell you, this little boy knows how to celebrate. A very simple celebration turned into a weekend event! Instead of having a party, Donovan opted for a school party and a trip to Chuck E. Cheese's. Xander and I sang the "Happy Birthday" song to him in the morning and I sent cupcakes, goodie bags, and juice for his classmates. My sister and her kids came up Friday evening and stayed the night. We all went to CEC's Saturday afternoon and then came back home to more birthday cake. On Sunday, my in-laws came up and took us to dinner at Applebee's, Donovan's choice. The entire weekend was a lot of fun and I'm so glad my big boy enjoyed himself! I took a couple of days off from scrapping, but I'm back at it!!! It feels so good to create something, just because...no deadlines, no restrictions on the supplies I can use...just dig in my stash and play...just for me! My friend Doral took this pic of the boys and me at the Kwanzaa celebration in our town. Although Xan is not looking at the camera, I like the photo. I created this layout to let them know that I love them "every single day of every sinle year", which is how I came up with the title. 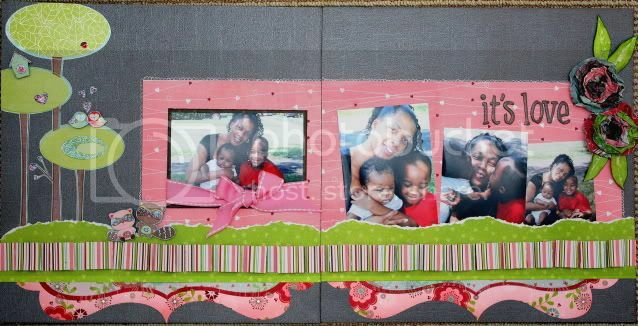 I had fun playing with smooch spritz on this layout. OMG, this stuff is ADDICTING! All you need is a litte spray...it's bursting with color and shimmer...I LOVE it! I had fun playing with all of my pretty, girly stuff today. Is there any combination more beautiful than Webster's Pages, Prima flowers, lace, and Frosted Grape smooch spritz? You ever create something and love it instantly? 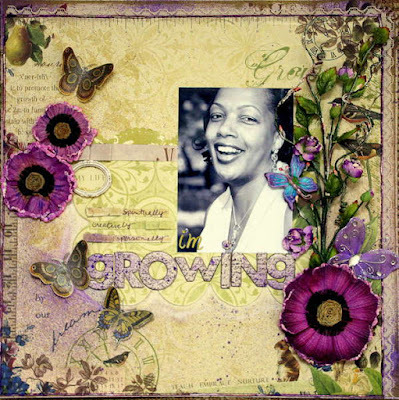 Yeah, this is that project for me...my current fave! Kathering Song took this photo of me; I was modeling her handmade jewelry for a catalogue and I love it. 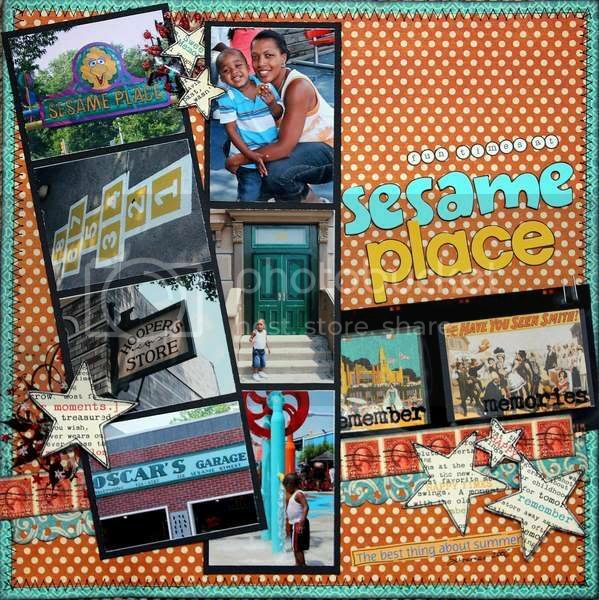 I need to get some really cool 12x12 frames. Finally, I had a chance to play with the new October Afternoon lines. I created the banner from one piece of patterned paper and then added Bella Blvd's new coin alpha to spell out the title. 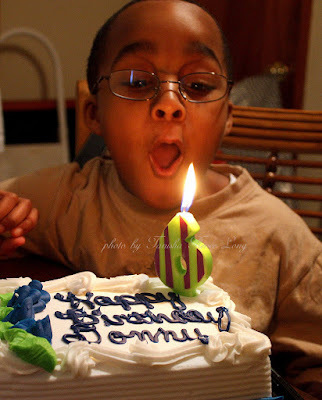 The photos are of Donovan's birthday celebration. Thanks so much for stoppin by! have a scrappy day!